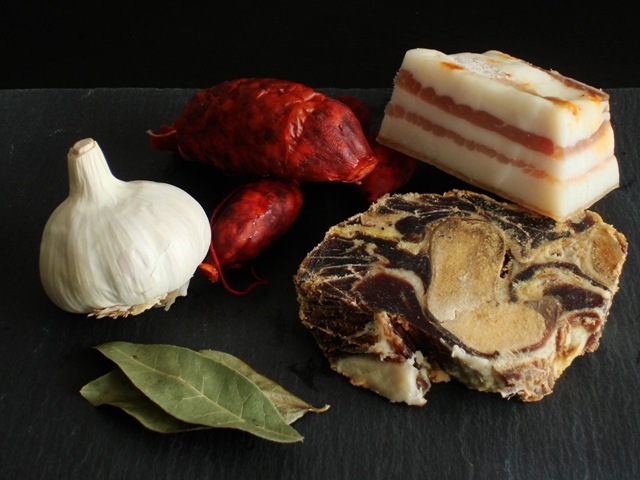 El guiso de trigo es humilde y sencillo, una muestra más de lo mucho que puede lograse disponiendo de poco. (Murcia’s wheat berry stew is humble and simple, yet another example of how much can be achieved with little at hand.) From Gastronomía Regional Murcia, a newspaper supplement published in the mid-1980s. Like many expats and emigrants, I often rely on foods from my past to nourish connections with people and places far away. This is why, for example, I always have homemade granola in the cupboard and enough butter and brown sugar to whip up a batch of cookies when a longing for home swoops in. Yet over time, I have also come to crave local foods in Murcia, which I see as a sign of rootedness and contentment in my relatively new home. As the days turn colder and my third winter here begins, I find I am hungry for traditional Murcian stews like the guiso de trigo. 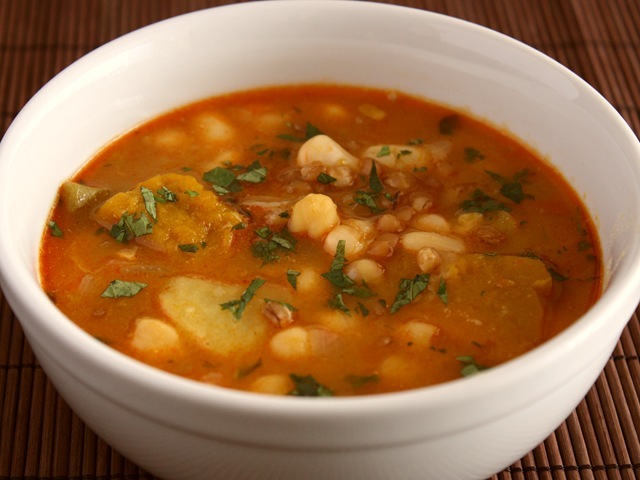 This hearty (and meatless) stew with wheat berries, vegetables and beans is one of Murcia’s staple dishes, whose ingredients reflect the city’s agricultural heritage. 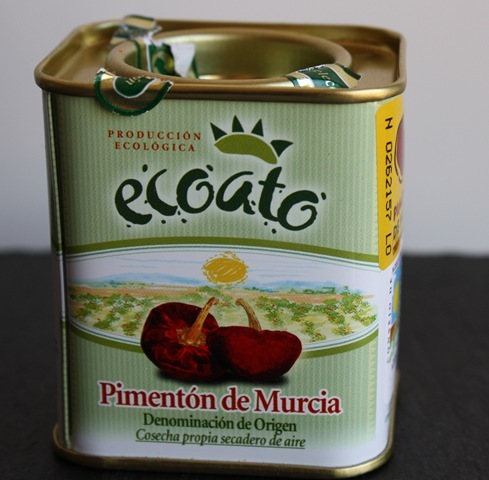 For centuries, Murcia has been a center of fruit and vegetable production in Spain, which has resulted in a vegetable-rich cuisine out of necessity. For me, the guiso de trigo is a perfect example of local culinary thrift, of coaxing maximum nutrition and flavor out of available raw materials. One trick is the sofrito, a building block in many dishes in Murcia as well as in the rest of Spain. By sautéing the onions and tomatoes in olive oil in a separate pan with salt and sweet pimentón – instead of just throwing everything uncooked into the pot with the beans and wheat – you significantly multiply the flavor potential. A sprinkling of mint, dried or fresh, contributes a cooling contrast to the warming pimentón, which stimulates the senses. Saffron threads, if you have them, are like red lipstick, adding a touch of color and intrigue. 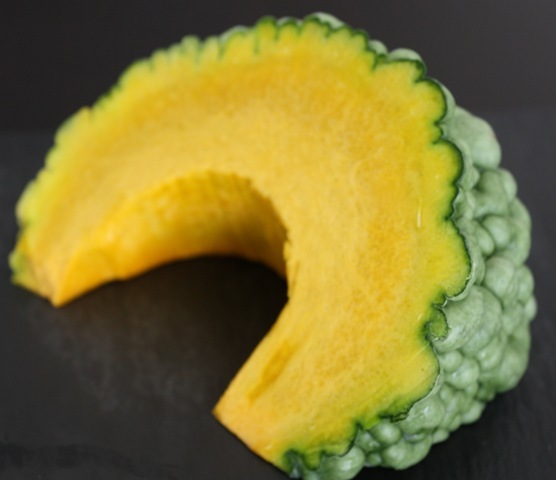 The squash aïoli is a stroke of genius. With four thrifty ingredients – squash (of course), garlic, salt and a ribbon of olive oil – you get a luxurious condiment. Swirling in a spoonful not only adds zing to the stew, but also lends a touch of sophistication, proving that frugal does not have to mean austere. Even though far more ingredients are available today in Murcia than in the leaner times when the guiso de trigo became a local tradition, the stew remains popular. 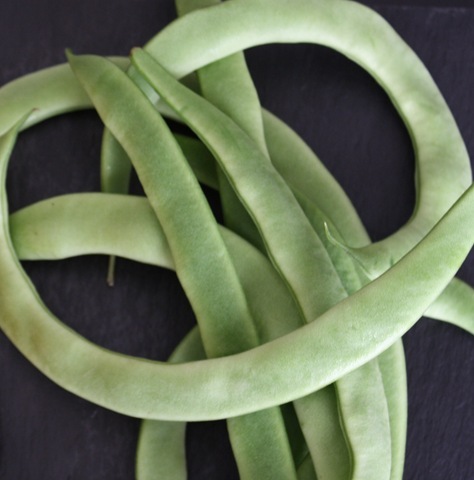 It can be found on weekday lunch menus in long-established bars and restaurants throughout the city, and commonly appears on grandmothers’ tables. 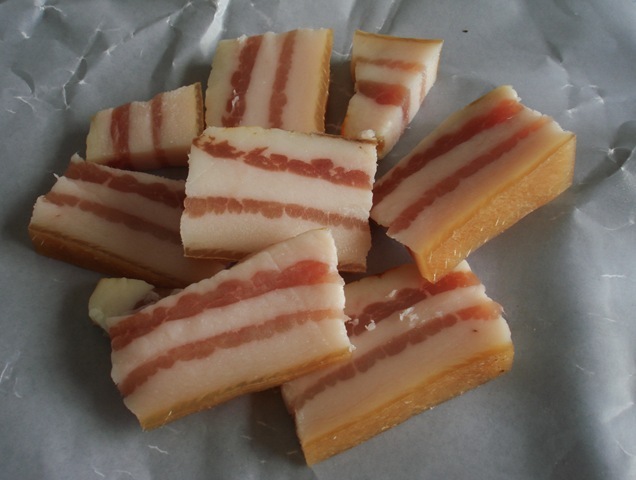 In both settings, it is typically served in wide soup plates with country bread on the side for dipping and soaking up the last traces of broth. On a cool day like today, when the sun probably won’t quite make its way through the clouds, it is easy to imagine adults and children throughout Murcia hovering over steaming bowls of guiso de trigo. This satisfying stew is not only nourishing and economical, but also familiar and comforting. I, too, will be having bowl of guiso de trigo today, enjoying the warmth and flavors which root me in Murcia. Adapted from two principal sources: A recipe in the cookbook Memorias de la cocina murciana, written by Carmen Peréz, and a recipe from the Hotel Rosa Victoria in Murcia as seen on the national TV program España Directo in 2009 (you can watch the video here) . As the guiso de trigo is a classic peasant dish, real saffron, an expensive ingredient, is not always included, and that is why I say it is optional. Many locals use a natural yellow food coloring, commonly used in paella, because the result is warming and visually appealing. Yet I find that the pimentón and golden olive oil lend sufficient color if you do not use the saffron. The saffron threads of course add complexity to the dish, and I have included them, toasted and mashed with garlic, according to the recipe in Memorias de la cocina murciana. The key factor in drawing full flavor from the ingredients is time, and all the little steps do make a difference. 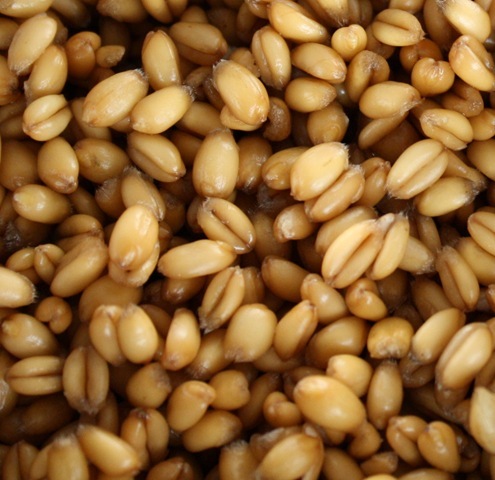 Place the soaked and drained wheat berries, garbanzos and white beans together in a large soup pot (I used a 6-quart pot) and add water. Bring to the boil and skim off any foam, reduce heat and simmer, partially covered, for about 1 hour. The beans and wheat berries should be partially tender at this point. While the beans and wheat berries are simmering, prepare the sofrito and the saffron, if using. For the sofrito, heat the 4 tablespoons of olive oil in a sauté pan over medium heat and add the onions. Cook, stirring occasionally, until the onions are soft and just beginning to turn golden. Add tomatoes, bring to the boil, then reduce heat to low and simmer, stirring occasionally, until the sauce is thickened, about 25-30 minutes. Add salt to taste toward the end, since the flavor becomes more concentrated as the sauce cooks down. Add pimentón and sauté for another minute. Remove the sofrito from the heat and set aside. Add the sofrito and saffron to the pot with the partially cooked wheat berries and beans (after the first hour of cooking), then add the green beans, pumpkin and potato to the broth, which is now a vibrant red color. Season with salt and fresh-ground pepper to taste. (If you are using dried mint, add now as well.) 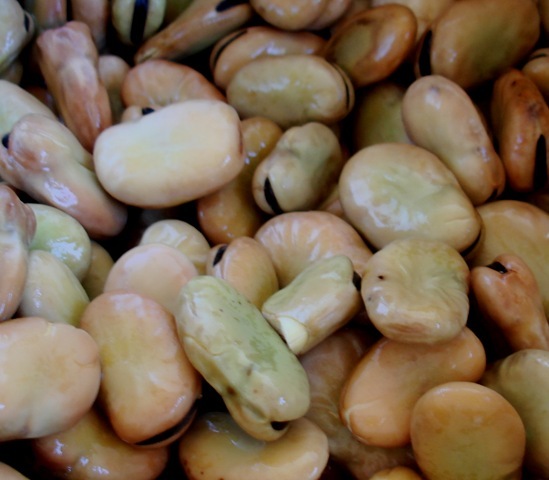 Bring to the boil, then reduce heat and simmer, uncovered, until the wheat berries, beans and vegetables are fully tender and the broth has slightly thickened, about 45 minutes. If you are using fresh mint, add it now, and adjust seasonings as necessary. Allow to sit off the heat for 5-10 minutes before serving. About ten minutes before the stew has finished, mash a clove of garlic in a mortar with a pinch of salt to make a smooth paste. 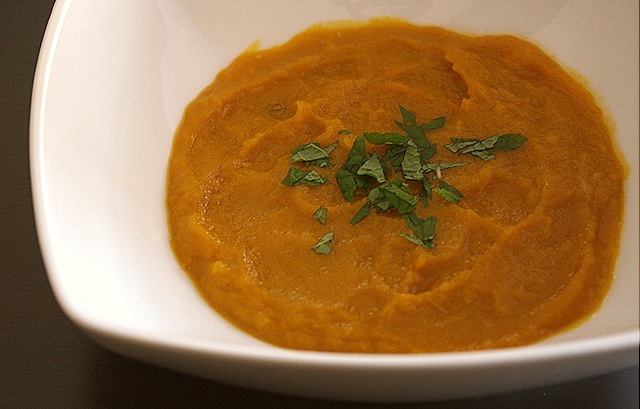 Remove half of the cooked pumpkin or squash from the pot and pound to a purée with the garlic in the mortar. Stir in a swirl of extra virgin olive oil. Serve the stew in soup plates garnished with a sprinkling of fresh mint. Add squash aïoli until your bowl has as much garlic flavor as you like. * NOTE: Grating is a quick and easy way to peel tomatoes, and is a favorite method of many cooks I know in Murcia. Cut the tomato in half, and gently grate over a bowl, flesh side down, using the large holes of the grater. The tougher skin will not pass through the holes, and you will be left with a tomato purée perfect for sautéing in this recipe. With the onset of chilly days, I find myself daydreaming about the soup pot, which had collected dust during Murcia’s long, hot summer. Now, simply imagining the steam rising off a simmering, one-dish meal warms and soothes me. My chilly fingertips typing away at the keyboard long to be wrapped around the promised bowl. Soup is comfort food in many cultures – a condensed version of the smells, flavors and rituals of one’s childhood. Perhaps this is why a single bowl of fresh, piping hot soup in any language offers reassurance beyond words. 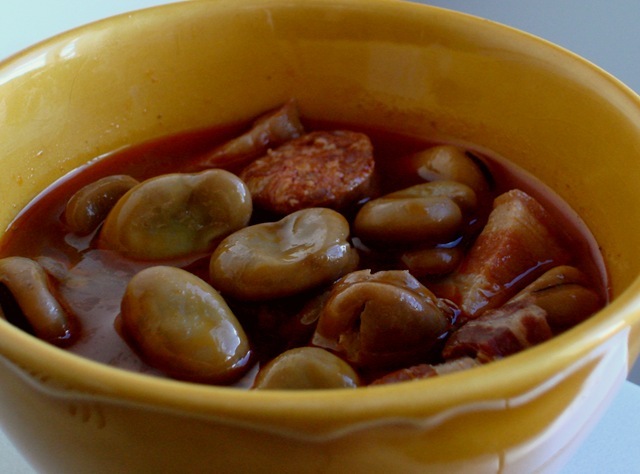 Here in Spain, stews are often called comidas de cuchara, meals which require no more than a soup spoon to eat. Most versions involve an aromatic broth packed with vegetables, beans and meats that easily yield to said spoon. There is comfort in this simplicity – one pot, one dish and one utensil. And the repeated act of lifting each bite to the lips and softly blowing, like I learned as a child, has a calming, meditative effect. For me, Murcia’s olla gitana, or gypsy stew, is particularly inviting. As is the case with most stews around the world, it is a dish of ingenuity, a hearty and satisfying blend of ingredients at hand. 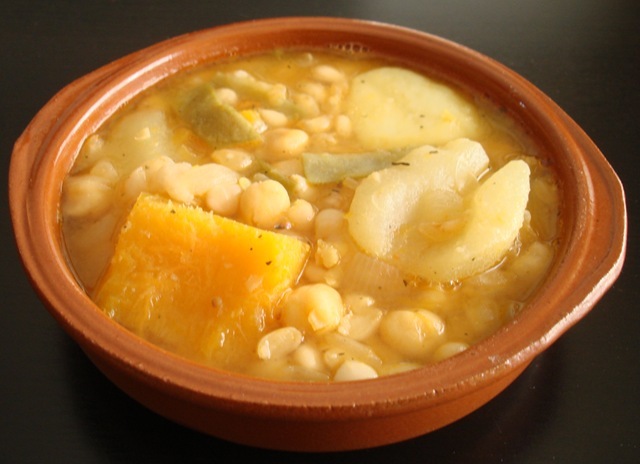 This vegetarian stew showcases the diverse fruit and vegetable offerings of Murcia’s long-cultivated lands. Yet the olla gitana is more than delicious nourishment – it is also evocative. The seasoning blend, for instance (extra virgin olive oil, sweet paprika, saffron and mint), recalls the region’s diverse roots, from Romans to Moors to the Roma people who lend the stew its name. And the warm-hued spices give the dish itself a sunny appearance, reflective of Murcia’s Southern Mediterranean climate. This is a traveler’s stew, or, more precisely, a dish whose ingredients from far and wide, and the people who carried them, have found their home, right here in my soup pot. Most traditional recipes call for saffron, which imparts the dish with a golden hue and smoky essence. 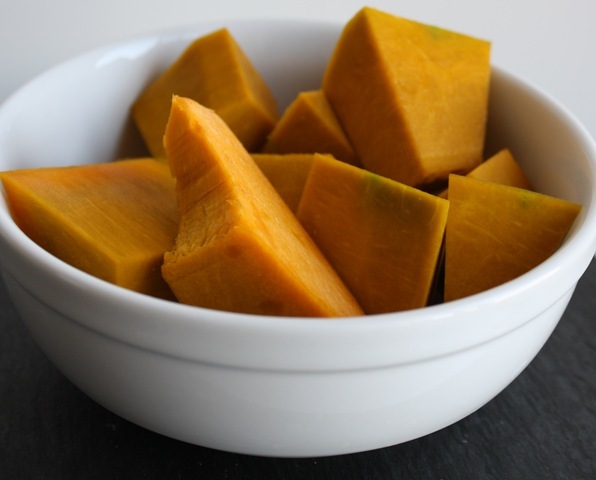 However, due to the cost of this luxury spice, many home cooks I have met here use a natural yellow food color instead, as brightness is considered an essential quality. An olla gitana without saffron is delicious in its own right, but a pinch of saffron certainly deepens the regional flavor of the stew. Drain chickpeas and white beans and rinse well. Transfer to a large pot and add the water; bring to a boil. Allow to gently boil over medium heat for 10 minutes, then skim off and discard any foam that has collected on the surface. Reduce heat to medium-low and simmer until chickpeas and beans are partially tender, after about 45 minutes. Add the salt and green beans, pumpkin, potatoes and pears. Return to a simmer and cook uncovered until vegetables have softened, another 20 minutes or so. Meanwhile, heat olive oil in a frying pan over medium heat. Add onion and sauté until translucent and just beginning to turn golden. Then add tomatoes and cook, stirring frequently, until reduced, about 7 minutes. Remove sauce from heat and stir in paprika (Valentina says that adding paprika over heat can make it turn bitter). The sauce will have a paste-like consistency. Add to the pot with the cooked beans and vegetables, stirring to distribute the color and flavor. Crush saffron threads between your fingers and add to the pot; stir in mint. Simmer for another 10-15 minutes, until flavors are blended. Vegetables will be falling-apart tender. 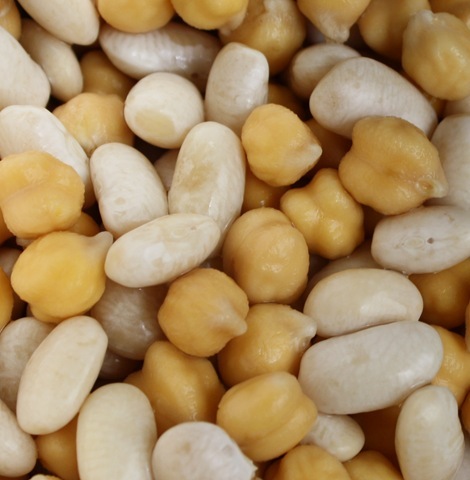 If you find the broth is too thin, remove ½ cup of the cooked chickpeas and white beans from the pot and mash to a purée in a mortar and pestle (or using a food processor). Return purée to the stew. Remove stew from heat, and allow it to rest for 10 minutes before serving, giving flavors time to settle. Taste for seasoning, adding salt and pepper to taste. I particularly enjoy this stew with a warming glass of hearty red wine, such as Monastrell from Jumilla, a wine-producing zone in Murcia. NOTE: Grating is a quick and easy way to peel tomatoes, and is a favorite method of many Spanish cooks. Cut the tomato in half (from top to bottom), and gently grate over a bowl, flesh side-down, using the large holes of the grater. The tougher skin will not pass through the holes, and you will be left with a tomato purée perfect for sautéing in this recipe.